Are you on a diet? Have you cut down on chocolates, biscuits and cakes and raided your nearest grocery store for healthy foods? Are you still not losing weight? This could very well be because you're choosing the wrong kind of foods. Some diet food options that you choose might look healthy, but are they really healthy? 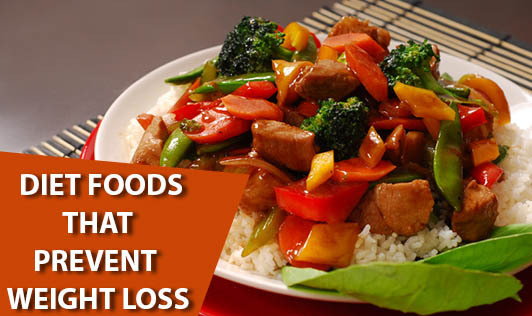 Check out the top 5 diet foods that let your diet regimen fail! Fruit Juices-Fruit juices contain a lot of sugar, artificial flavor, preservatives and calories. You may end up consuming as many as 150 calories or more with just a glass or two. If you're wondering about substituting it with a glass of fresh fruit juice, it may be a bad idea too! Fresh fruit juices lack fiber, causing rapid absorption of sugar leaving you hungrier faster. Granola Bars-Granola bars have always been looked upon as a perfect healthy fiber- rich ready- to- go diet food option while traveling, but do you know most granola bars are packed with malt sugar, corn syrup and high levels of fat? In fact, some granola bars contain calories as much as a normal chocolate bar. So the next time you're starving and are away from home, definitely think of a better option to munch on. Flavored Yoghurt-Plain yoghurt naturally contains some amount of carbohydrates, but if you are planning to eat flavored yoghurt, you could possibly be loading yourself with an additional 15 grams of sugar, which definitely is a bad idea if you are trying to lose weight. Sugar free cookies-Sugar free cookies may not have refined sugars, but they are still unhealthy. Sugar free cookies contain artificial sweeteners, which may not be good for you. In fact, they may often have high amounts of fat added in it. So, you may save on the calories from sugar on one side but may end up adding much more calories from the fat in these cookies. Sports Drink-Sports drinks are actually designed for athletes who undergo intense training sessions with massive sweating and depletion of glycogen. Sports drinks contain water to replenish the lost fluid, electrolytes to replenish sodium which is lost from the sweat and sugar to give instant energy after an intense workout. One bottle of your favorite Gatorade contains over 30 grams of sugar. So, if you are just taking a flight of stairs or doing just 30 minutes of light jogging, taking Gatorade will only add on to your calories. Hence, stick to plain water whenever you can to avoid unnecessary calorie intake. If a packaged food tells you it's healthy, it's probably not. Don't fool yourself with the so called "Diet Foods". Talk to your dietitian for the right advice.